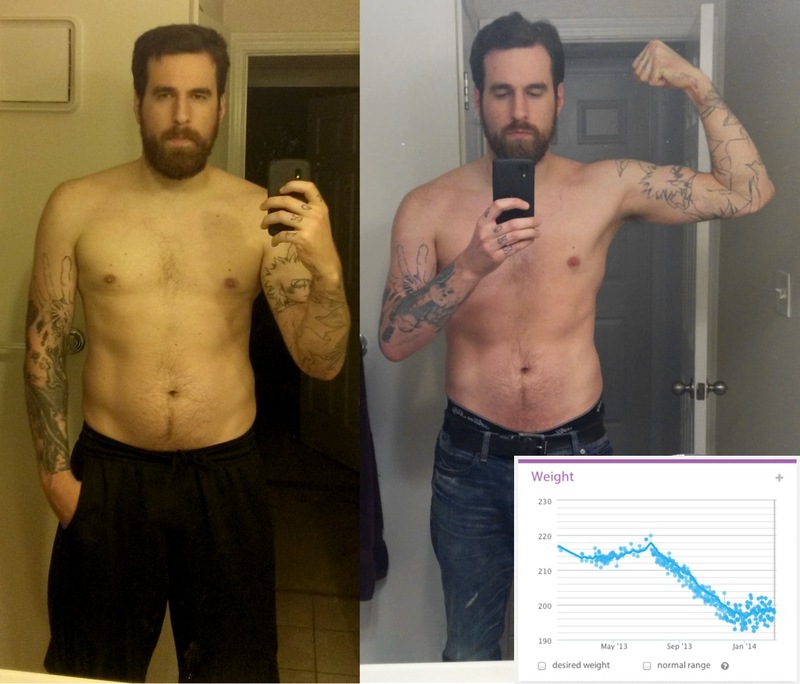 Note: This is likely the first entirely non-development focused post I've made, but I felt it was worthwhile to share my experiences in nutrition and fitness over the last year. An increased intake of dietary fat will lead to an increase of body fat mass over time. A diet consisting of high amounts of saturated animal fats will lead to unsafe levels of cholesterol. In order to burn body fat, you need to expend more calories than you intake on a daily basis. From even a cursory glance at the research available, it seemed obvious to me that these claims were at best dubious. But I resolved to take on my own task of self-experimentation to develop a personal understanding of just how certain foods affected body recomposition efforts. 1-2 chicken breasts stir fryed in macademia nut oil, unsalted organic grass-fed butter, peppers, onions, broccoli, cauliflower, water chestnuts, and sriracha. This seems like an exceedingly strict meal plan, but honestly it was super easy to follow. In fact, I attribute much of my success in adhering to this as a function of its relative simplicity. It was easy (and cheap) to shop for these ingredients regularly, keep my shelves stocked, and it was fun to experiment with different spice/sauce variations using the ingredients I had on-hand. Its also worth noting that I did drink alcohol fairly frequently. I'm a huge Bourbon fan, so during 3-4 of those 6 days I would have a small glass of Bourbon neat. The process of distillation makes the amount of carbs and residual sugar almost negligible. I experimented with my intake and found it had no significant effect on my results. Note: My food choices here are clearly not nutritionally ideal. There was a psychological benefit to binging on some of the comfort foods that I found myself missing from time to time. You could easily carry out a high-carb Faturday with more nutritional fare (e.g. fruits, whole grains, etc). In terms of fitness, my approach was basic. Kettlebell swings and some random dumbbell work. That's it. No insane fad fitness program to speak of (e.g. CrossFit, P90X, Insanity, etc). In my experimentation, exercise was the least impactful portion of my approach to body recomposition. So now we get to the portion of the post that probably matters the most. How did I do? I've included my weight loss graph (care of my Withings Body Scale) to illustrate the precise cliff drop in weight and body fat I saw immediately when I changed my diet. At my heaviest I was 220 lbs and at my lightest I weighed in at 192 lbs. I have since stabilized, which is to be expected, but I managed to log my lowest point just before the new year. When I started this experiement I weighed in at 220 lbs and 28.5% body fat. Today I weighed in at 196 lbs and 19.2% body fat. Those are significant improvements in almost all of my lipid measurements. The increase in triglycerides, as Tim Ferriss has noted in his work, can be associated with the significant fat loss as well as the mechanism of triglycerides as the fat transport molecule for the body. Note that while I saw an increase in that metric, it still falls well within the safe/optimal range. False. I pursued a diet extremely high in saturated fats (including all the oils I cooked with) and I saw a 9% drop in body fat. False. In my case, I saw improvements in almost all points of my lipid profile and every metric fell within the safe/optimal range. False. I went from working out almost 6 times per week for over an hour each time to 2-3 days per week for only 25 minutes on average. I also increased my calorie intake by 1.5-2k a day on average.